All work in Antarctica relies on a consistent geographic framework, and the main function of the new Standing Committee on Antarctic Geographic Information (SC-AGI) is to manage and improve the geographic framework not only for Antarctic scientific research but also for other activities including operations, environmental management and tourism. At the XXIX SCAR meeting in Hobart 2006, the Expert Group on Geographic Information (EGGI) was repositioned from within the Standing Scientific Group for the Geosciences to become SC-AGI. 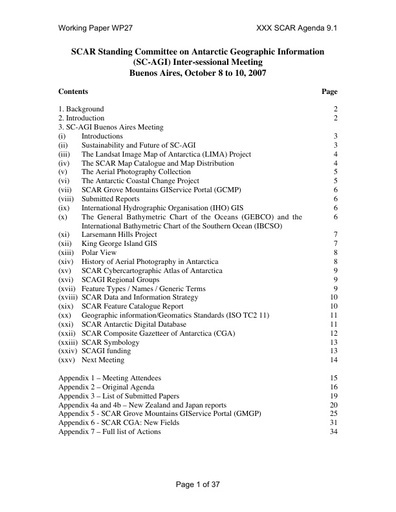 SC-AGI is the direct descendant of the SCAR Working Group on Cartography, formed in 1958. Building on the work done by its predecessor EGGI, SC-AGI continues to deliver a range of up to date Geographic Information products through its various projects. These products include the SCAR Composite Gazetteer of Antarctica, the Antarctic Digital Database, the SCAR King George Island GIS Database, SCAR Map Catalogue and SCAR Feature Catalogue. SC-AGI integrates topographic and names information received from national Antarctic programs into the SCAR ADD and SCAR Composite Gazetteer of Antarctica. SC-AGI promotes an open standards approach to support free and unrestricted data access and develops the respective specifications including the SCAR Feature Catalogue and Symbology. The Chair of SC-AGI is Henk Brolsma. For further details see the Antarctic Spatial Data Infrastructure (AntSDI) website.